Aw it's a wittle baby Joker! Don't you just want to pinch its cheeks and coo "why so serious?" at his creepy smeared lips? 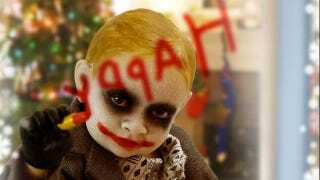 Let's hope this adorable Joker Doll inspires the internet masses to clamor for a Dark Knight Rises Baby Doll line. It can't be any worse than Baby Voldemort! The images are from the website J.ME, but there is no other information on where one can buy this particular item. Until we can find out more about this doll, just enjoy the insanity that is the Son Of Joker.